Ayman Elmasri (left) with his roommate Mark Kravitz. Photo by Kay Hinton. College means both learning to live independently for the first time and as part of a community of peers. 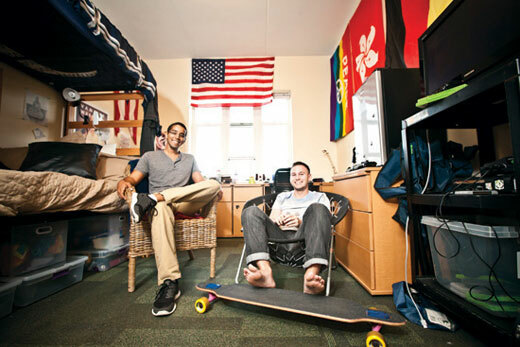 For many students, there's a degree of culture shock; but the process of setting up a dorm room and bonding with a roommate can go a long way toward creating a new home at Emory. Sophomores Ayman Elmasri 17C and Mark Kravitz 17C became friends when they lived across the hall from one another as freshmen in Evans Hall. The two have much in common—a shared sense of humor, a double major in neuroscience and behavioral biology, and dads who are doctors. They also both were selected as sophomore advisers for their floor in Evans, so they chose to become roommates as well. Along with their many similarities, the two have some differences to work through. "He has ridiculous taste in shoes, and I have normal taste in shoes," says Elmasri, gesturing toward at least a half-dozen pairs of shoes next to Kravitz's bunk. "He has horrible taste in music, and I have great taste in music," Kravitz jabs back. The pair decided it was "absolutely essential" to bunk their beds to make maximum use of their 10-foot, 8-inch by 12-foot, 5-inch living space. Elmasri will occupy the top bunk until the end of first semester, then Kravitz will get top billing for second semester. "It's the only fair way to do it," Elmasri says. Lining the walls are full-sized flags that are meaningful to each of them. The flags of Sudan and Germany represent Elmasri's dual heritage, while an American flag and an Ohio state flag salute Kravitz's home state. A Hong Kong flag was a gift from a friend, and a rainbow peace flag represents dedication to providing a safe space for all and supporting equality.